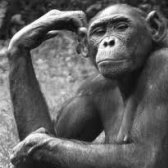 So you got a response from the state biologist but will not tell us what he said? I presume it was not confirmation of the existence of BF in the state. You want support of people lining up behind you, to do a similar approach, but will not commit to sharing notes. Why should they? When someone gives me a maybe it usually means they won't. You basically answer your own questions. The only thing that makes sense is that there are powerful forces at work trying to cover up existence. Why I do not know. If that is true, Joe Blow citizen is not going to get answers emailing or writing anyone. Maybe if you could get a Congressman or Woman interested that may work. But it sure has not in the case of the Government and UFO's. A couple of Presidents who asked about UFO's have been told that they have no need to know. Joe Beelarts experience with the Tarzan Springs inquiry of the USGS is about the best you can hope for. Some lower level staffer defied policy, and read him the field notes of the mapping crew over the phone. Totally deniable because nothing was on paper and it was done over the phone. So we only have his word that it happened at all. So unless someone has the money and assets to conduct intelligence gathering against the US Government, no one has a prayer to get anything unless some whistle blower with documents comes forward. Bugging or burglarizing government agencies will get you arrested. The only tactic that may work is make yourself available to whistle blowers. Related to that, a couple of weeks ago, I posted a Craigslist ad, asking that anyone who worked as a logger or logging truck driver who had seen a bigfoot to contact me. I told them to remain anonymous but just tell me three things. If they had seen or knew of others that had seen BF. where it was, and if their company had penalties if they talked about BF. The ad did not last 24 hours before someone flagged it and got it removed. Someone out there cares about squelching BF. I do not know if it was a logger, a logging company, or a government agency that got the ad pulled. The government is fully capable of having bots that patrol the internet looking for activity they might want to stomp out. If you get right down to it, for all we know Hiflier is an agent of the government trying to discourage research. He sure is trying to tell us that things are hopeless. What insightful comments you all have made. I have to go back I and read them a few times. For myself, I waffle back and forth with wanting to prove their existence or to have proof for myself of their existence. i think that question is too large for my life at the end of the day, and I should simply be grateful for the experience of knowing that they exist, and even now, before seeing one, become more active in preserving their homes. Perhaps I should spend as much effort in protecting them as in trying to understand them and experience them. It's more logical to prove the existence of something and then to protect it, but perhaps it's less efficient and less helpful to the actual species to do so. How dangerous is it to be BiGFooting alone? Now that Spring is here, I hope everyone is starting to get out and explore the woods. I've been out a few times already; one to retrieve a trail cam. Much to my chagrin, it was unceremoniously removed by an unknown third party. It's replacement is on it's way and back out it goes to hopefully provide more information about what is routinely coming through the area and when. I'm looking forward to a productive Spring and am mindful to put myself out in situations where something might approach. There is one place in particular I go that has had sightings/encounters that I will do overnights with a friend. This place is very spooky/creepy and wildlife noises are always absent at night. It is also a place where a person has gone missing without a trace. It is the only place I go that I have not gone alone but always willing to go with a buddy. I've never had a good feeling going there and have never been reluctant to go alone before to any place. The irony is it the best place to trigger a sighting/encounter but there's something not quite right there. My instinct tells me to buddy up but I may thrown caution to the wind one of these nights. I keep telling myself that if I use a perimeter security system (keychain alarm and fishing line) and have my thermal at the ready, I should be fine. We'll see. I'm not looking to get married again. As it turned out i am a little bored, wearing worn out tennis shoes, the dogs need to go out, and have a patch of dirt available in the woods behind my house. Here is a print of me running and jogging through the moist ground. I also walked across it but left no visible print. I was able to generate the vertical lines seen in your print. However, my running print was very short as I was on the ball of my foot. The jogging print is closer to yours but you can very clearly see the rounded toe box and heal impression. Your print looks closer to a barefoot bipedal jogging. Unfortunately I did not have a good spot to try that out. The most logical answer is that you have someone using your property to practice their cross country track. Does that sounds feasible to you? 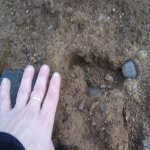 The fact that you took the time to find this site and post your pictures says that you are concerned that you may have a bigfoot lurking around that could endanger your animals and even family. So with that said a few more questions and thoughts for you: Is there anything else going on beyond the prints that make you think there is a BF in the neighborhood? If the area is fenced in, follow the trail as best as possible to the fence (going and coming) and see if you can spot any hair stuck in the fencing. If you do, take pictures of it and then collect it with tweezers and gloves and drop it in to a plastic bag and send me a PM. Those are some pretty mountains in the background. I assume that is a wilderness area and a good place for an animal den. Not sure if you have any hunters in the family, but I would definitely scout out that area to see what I could find. If the mountains are his destination, can you tell where it came from. By any chance do the prints lead back to a barn that is missing some horse sweet feed? Also to the prints come and go or just pass through your property in one direction? BFs end to be scavengers when food is scarce. Make sure you have no food left out and available to him. If you think it is a BF and want to get rid of it, mount a cheap trail cam. That will guarantee he/she will never return. Are the blackberries in season? If so, I think we know the answer as to why he just started showing up recently. I would stay outside late at night for a few nights and see if I could here any weird howling or moaning. Google "Bigfoot Howls and Moans" to get a sense of what people think a BF sounds like. If you hear them, try to record them an post them here. Good Luck. I am not on the site often these days so feel free to send me a PM if you want to discuss this further. I had a daughter spy a BF standing outside her bedroom years ago and know first hand how concerning that can be. Anything that keeps you dry is half the battle. If you get and stay wet you are not likely to survive for very long. The climate in the PNW is benign in the winter as far as temperature. But people who get lost do not last too many days if not found because they get soaked through. Here is an excellent video (two parts) of how to rig a quick shelter in frigid weather that can save your life. It is from Dave Canterbury of Dual Survival. It involves a 2 mil painters plastic and a space blanket. Very little cost and next to no weight to carry with you in the backcountry. A fringe benefit is that fire will help keep some predators away and keep you occupied so your mind (and imagination) doesn't run wild.